This rather unusual medieval cross is mounted on the corner of the perimeter wall of Addergoole or Carrowntomash graveyard near Dunmore Co. Galway. It bears a crude image of the crucified Christ. The cross appears to be unfinished. Local tradition states that it functioned as a market cross at a nearby site. 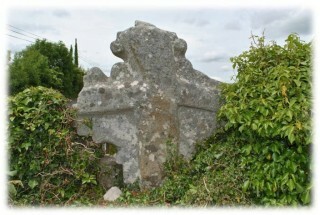 While this may have been the case it could also have functioned as termon or boundary cross. It is carved from sandstone.